Contemporary Craft (CC) has long maintained a commitment to excellence and innovation in craft media, harking back to 1971 when Elizabeth Rockwell Raphael demonstrated tremendous foresight and vision by founding this organization, known at the time as The Store for Arts and Crafts and People-Made Things. As her interest in contemporary art matured, she had begun to discover artists working in craft media who were exploring new and unexpected directions in craft media, avenues that had not yet been explored within the field. She was very excited about this new work and passionate in her belief that these artists were breaking new ground and deserved to be given serious public attention and financial support. Four decades later, interest in contemporary craft is continuing to grow rapidly, with the opening of many new facilities devoted exclusively to contemporary craft and traditional institutions expanding their collections in (or shifting their focus to) contemporary craft. CC was clearly a pioneer in the field due to Raphael’s innovative thinking. For this reason, we share with you this interview conducted by Florence Rosner with Raphael in 1984-85, shortly before Raphael became ill and was forced to step down as founding director. We hope you will enjoy hearing, in her own words, about the early years of contemporary art in Pittsburgh and at CC, and realize just how daring the undertaking was at the time. Fortunately for us, the clarity and prescience of Raphael’s vision was such that CC’s actions today are remarkably similar to her original intention. Many of the young artists she discovered and invested in have matured into seminal figures. And, her legacy carries on, as we continue to showcase the best work being produced in the field —nationally and internationally — and celebrate emerging talent and new directions through initiatives such as the biennial Raphael Prize for excellence in contemporary craft, the LEAP Award for young emerging artists, and our internship program. Betty Raphael (Elizabeth Rockwell Raphael) recalls her life in the arts over the past 44 years, starting with Pittsburgh’s first modern art gallery, “Outlines,” in 1941 and most recently, the first wholesale crafts showroom in New York City. This is a series of conversations with a friend, Florence Rosner. FR: Betty, when did you first become interested in art? BR: I studied painting in college and became very enthusiastic about it. I wanted to tell the rest of the world what painting was all about and I graduated from Sarah Lawrence I came back to Pittsburgh to do it. I didn’t want to stay in New York as I felt it was too cloistered an atmosphere. It was too easy to be complimented on what you were trying to do in New York. FR: What do you mean by that? BR: Modern art had already arrived in New York. This was 1941. I didn’t know if Pittsburgh would be a good place for new art but I felt it was the only alternative for me. It never occurred to me to try anywhere else in the country. FR: What were your plans? BR:I wanted to have not just exhibits, but also events – i.e., lectures, concerts, slide shows, films, everything. So first I arranged a general show of Post Impressionist to Abstract art. This was held at 341 Boulevard of the Allies. The first show had about 30 paintings that I borrowed from dealers that I knew in New York. FR: Was that first show successful? BR:Well, yes and no. I had a press opening the night before the show and no one came. It was catered – we had waiters in tuxedos and very fancy tables. When no one showed for the opening, we went across the street and invited the firemen from the fire station to come over and have something to eat and drink. We had our own good. FR: Whose paintings did you have for that show? BR: Seurat, Joseph Albers, Max Beckmann, Brach, Calder, Chagall, Derain, Lionel Feininger, Gris, Carl Hofer, Kandinsky, Kane, Klee, Koppman, Leger, Matisse, Modigliani, Radon, Rivera. Notice that many of the people on the list were German because the dealers who were my friends and anxious to lend things were Kurt Valentine, Carl Nierendorf and J.B. Neiman, all refugees from Germany. FR: This exhibit was in October of 1941. Was this space rented as a gallery or was this a one-shot exhibit? FR: Did you stay at this location? BR: Eventually we moved to the 2nd floor of the Playhouse because the rent was cheap. We were in the space that’s now called the Studio Theater. After a while we moved back into downtown to Oliver Avenue at Wood Street. FR: Going back to that first exhibit – did anything sell? BR: Only three things sold the whole time the gallery was open. It’s easy to remember what they were, a Roualt block print bought by Catherine Casey; a couple of Albers prints that I sold for $10 apiece. I kept giving Albers away to my friends for engagement and wedding presents. I haven’t one left. Also some Calder jewelry was sold. His jewelry ranged in price from $10 to $50. It was all silver. FR: In that first year at Outlines, what were some of the paintings prices? BR: The Matisse paintings (we had two in the first show) were probably about $200 each. The Picasso was $3500, the Seurat more than that. It was the most expensive painting in the show. FR: What did you plan for the second exhibit? BR: Our second show was from the Chicago Bauhaus and the earlier Bauhaus in Europe. We borrowed some things from the Modern Museum and a lot of student work, even some from CMU. The show on industrial design had student and faculty work from the School of Design in Chicago, from Carnegie Institute of Technology here in Pittsburgh (now CMU) and from Black Mountain College, the Georgia Institute of Technology – all with curricula modeled after the German Bauhaus. FR: What was Black Mountain College? BR: Anni and Joseph Albers went there to teach. I believe it’s still in existence but not the same anymore. When the Albers went there, there was nothing but the land. Anni Albers started by teaching the kids to make jewelry out of scraps. I still have a few of her pieces – paper clips, spools of thread, and other things like that. These were for sale at the gallery for $5 and $10. I bought three of them for myself and still have them. FR: Betty, why did you decide to move the gallery from the Playhouse in Oakland back into downtown Pittsburgh? BR: The war was over and interest had begun to pick up in some of the things we were doing. I talked to Edgar Kaufmann (Department store owner, art collector, and owner of Frank Lloyd Wright’s Falling Water) who had shown some interest way back at the beginning, and I asked him if he would help me. He said yes, he’d be glad to. He no sooner had said that than he went out to Palm Springs, California, for the winter. FR: Where was the new gallery and how much space was there? BR: It was on Oliver at Wood Street. It was rectangular and quite nice. We existed there for 8 months before I began to realize that having Mr. Kaufmann as a patron did not solve all problems. Actually, he had done nothing. He didn’t even come to events or openings. He finally said to me, “You mean, this place isn’t making any money yet?” I answered, “No, we haven’t tried to sell things, specifically, or to interest individuals in buying because we planned on asking corporations for funds.” He answered, “For heavens sake, that wasn’t what I understood. I think you better just pay off your debts and get out of this.” We closed in October of 1947. FR: You weren’t closing just on Edgar Kaufmann’s suggestion, were you? BR: No, I was married by then and I was pregnant. It seemed as good a time as any. I returned the art that was borrowed; we sold the furniture at very low prices just to get rid of it. The art that I had bought, I kept. There were a couple of Calders, Klees, Cornells, and a bunch of drawings, etchings and lithographs by some of the German artists – Feininger, Muller, Christian Rolfs. FR: Have you sold any of the work that you bought at that time? BR:No, I don’t believe in collecting in that way, in which you buy things as an investment and then sell them to make money. I always bought them because I liked them and wanted to keep them, and also because I had a place to hang them. FR: From all the years of the gallery, do some events stand out in your mind as very special? BR: Yes. John Cage and Merce Cunningham worked together more than they do now, and came here to do a program together. John played the piano and Merce danced. Many people came to see them and asked so many questions afterwards, they thought there might be enough interest in Pittsburgh to hold a class in composition and a workshop in dance. So John had a composition class of about 15 and Merce had a slightly larger group for dance. They rented an apartment near the Playhouse, where the gallery was at that time. John thought Pittsburgh was the most wonderful place – they could look out their window and see the steel mills. They stayed for about 6 weeks. FR: Whom else did you invite that you felt was outstanding? BR: We had Siegfried Gideon, who wrote, “Time, Space and Architecture.” It’s used as a text at some schools of architecture. He was German with a thick accent, but he was so articulate. J.B. Neiman, who had a gallery in New York, came and spoke two or three times. Of course, we lost money all along the way but we had a grand time. There were always enough people around who thought that what we were doing was wonderful—they weren’t all my personal friends—but they were a small group of self-appointed intellectuals who enjoyed it all. FR: This was an opportunity for people in Pittsburgh to be exposed to names they would only have read about otherwise. BR: Yes, and that’s what happened. They came out from under rocks and from behind telephone poles. We never did know where everyone came from. FR: So, even though the gallery wasn’t a financial success, it was a great success for you. I’m sure that when you closed, the gallery’s followers must have missed it very much. There was nothing else like it. BR: When Alex was born, Calder made a pull toy that he gave me. But first, when she was first born, he made a wonderful card out of a government post card by cutting and then coloring it. It said something like “Welcome to Alexandra” – then six weeks later this toy arrived. It was a little pull toy with essentially two wheels and wire with a duck. Its body is a spool. We still have it. FR: Did you ever invite him to Pittsburgh? BR: He had a circus that he had made himself and we asked him to come here with it. It had never been shown outside of Europe. First he said no, and then I think I offered him a one-man show at the same time and he agreed to come. We were on the second floor of the Playhouse then and we started to worry about space for the circus, which was quite large. So I wrote to Homer St. Gaudens, who was head of the museum. I asked him if there was any chance of having it at the museum. I think at this time Dave Thompson had just given the large Calder mobile to the city – the one that hung for many years at the airport – so I thought this was a good time to have the circus. Well, Mr. St. Gaudens wrote me a letter that was completely insulting, saying it was a frivolous idea and that they wouldn’t have anything like that at the museum. He was very conservative, with no interest in modern art. So we didn’t have the circus, but we did have Calder’s one-man show. In the meantime, the circus was going to be shown in Washington, DC as a benefit performance for the Free French, and Calder invited us to come down. In fact, he had already shipped it here, so we had it. Orin and I drove down to Washington with it and had a wonderful time. The performance was given with a number of important people seeing it. Calder always needed a few people to help him with the circus. He needed someone to help with the roar of the lions and he asked Orin to do that. Calder would give the signal when to roar. Calder made a pair of earrings for me but they were for pierced ears. Once when I went to see him at his apartment in New York, I asked him if he could change them so I could wear them. “Why, come on,” he said, “let’s pierce your ears” and got out this big safety pin. I told him I didn’t think I’d have anyone pierce my ears. FR: You also got to know Joseph Cornell pretty well, too, didn’t you? BR:Yes, but he was such a private person. I went to see him when I first saw his work at Peggy Guggenheim’s gallery in New York – The Art of the Century – and asked her if there was any chance of getting him for a one man show. She said she’d be thrilled but would have to ask him. I wrote him a couple of letters and may even have visited him and he was excited about it but said that he wouldn’t leave his home in New York. He wouldn’t talk to anyone – so he didn’t come although we had his show. It may have been the first one-man show Cornell’s work in the country. The show was very popular. His work is easy to like, the way he used all familiar objects. He lived in kind of a dream world. He lived in a strange row house in Brooklyn with his brother and aging mother. I felt Cornell’s life was quite sad. The only artists who admired his work were surrealists – first the Julian Levy Gallery and finally the Metropolitan Museum had a very small but nice exhibit of his work. Nothing happened for Joseph until years later when the Modern Museum decided to give him a one-man show- it was a huge show – too big for his work, actually. But it was a good show. FR: After the gallery closed, did you continue to be involved in art? BR: I was always ashamed afterwards that I couldn’t write to an artist in New York and offer him a one-man show or invite him to give a lecture, or that I couldn’t do anything for him anymore. I kept in touch with John Cage and Maya Deren but not the others. (In the 1960’s Betty started a children’s day care center as part of a Community Action program). FR: I thought when you started the children’s center that you had left the art world. BR: No, they went hand in hand. They just seemed to go together. It was about then that I got interested in crafts. (As a Girl Scout leader, Betty initiated an Indian crafts project as a self-help program for the Seneca Indians of New York State). I believed crafts were the coming thing. They were very uninteresting – very few professional craftsmen. But it started here along with the Community Action Corporation when we started The Store. (In Verona, PA, a mill town near Pittsburgh). We started with local amateur crafts but soon I suggested to the board that we buy some crafts that were good and that we knew we could sell. FR: What was the Community Action Corporation? BR: That came from the Economic Opportunity Development for any community that wanted to help itself. I saw it as a community action program – a way to do something for people, and to raise their consciousness. This led to the Sociable Workshop. We thought that we could get people to design things that we would then produce and sell, the money going back into community programs. We went along with that for about five years. But we’ve now concluded that there is no hand made thing that can be sold for little enough to pay for itself, much less pay for the promotion needed to sell it. FR: But there were some things that the Sociable Workshop produced that sold well. What were those? BR: There was the Santa Claus, the woven pillows, knitted sweaters and also the Christmas stocking. We advertised for good knitters – at one time we had 63 people knitting for us. But we had to pay them a decent wage. We didn’t do too well with the Sociable Workshop but it was because we had to invest in the promotion and we didn’t want to do that. FR: When you branched out from the Sociable Workshop by buying crafts to sell in The Store, how did you go about doing that? BR: We started going to craft wholesale trade shows – the Springfield Fair, The Baltimore Fair and Rhinebeck N.Y. By and large we did all of our buying at the trade fairs. We’ve had a very good quality of crafts at The Store since we started. FR: Were you actually buying all the crafts for The Store or were you taking them on consignment? BR: No, I was buying everything. I felt that anything I would buy, someone else would buy. Eventually, mostly everything did get sold, but there’s not a big volume of business in it. FR: How did you decide to open the New York wholesale showroom? BR:Well, our own experience with the Sociable Workshop was that the first thing wrong was selling crafts in a general store or gallery with other things – with the crafts not separated from the machine made things – that they were just shown with everything else with no hint that they were different. We thought there should be a central place where only crafts would be shown. So we decided there should be a place in NY that wholesales only crafts, a non-profit co-op for the artists. (The National Crafts Showroom opened at 11 East 26th Street, NYC, in January 1984). It’s sad, even now, people come into the showroom and don’t believe that all these things are really handmade. Or they don’t understand what handmade means. They want to order eleven dozen of this but in a different color. We’ve had to explain to each one that production is very limited. FR: To what do you attribute the present interest in crafts? BR: People like the home touch – the look that isn’t as slick as a machine made piece. The idea of hand made objects is appealing today, in the same way that machine made objects were appealing after the Industrial Revolution. Then everyone wanted machine made things. But everyone can relate to crafts – if they don’t have a craft hobby themselves, they have a cousin who does. The idea of crafts is very folksy, even though they become as important as any art form when they’re well done and require as much skill. They may not appreciate how much they have to cost, but they do understand the painstaking work that goes into it. I think people need both kinds of products. We’ll always have things that are machine made and we’ll always have the hand made which are quite different, and somehow more valuable. FR: If you were advising students today, would you tell them to go into fine arts or crafts – or is there any difference anymore? BR: The distinctions are not that clear, there are two parts to crafts today. There’s the utilitarian craft that is reasonable attractive. If the work is good, you can almost demand any price – for example, today you can buy a one-of-a-kind bowl for $3,000. If it’s really unique, there are people who will pay a great deal for it. FR: When you started to get interested in crafts, did you judge them as fine art or as production work? BR:I knew there was an interest in production crafts and for the sake of price I knew we should be interested in them but I didn’t go out of my way to find things that were made in multiples. The thing is that when you go to a craft fair most of the craftspeople are selling. But I never considered that in buying. I hesitated to buy expensive single, unique items because I knew they would be hard to sell, especially if they were expensive. But I bought some – I just really bought what I thought was good. FR: But I suppose you were still interested in multiples due to the Sociable Workshop. BR: Oh yes, and when I found something I thought we could make, I always about licensing, etc., so that we could do that but I only bought a few things that way. But in any case, I was really buying for The Store for resale. I wasn’t that concerned about multiples. FR: Many galleries take things on consignment. Have you done that? BR: Very seldom, but once in a while with very expensive things. A successful artist can usually have shows at galleries where most of their work will get sold during the show. But Verona is not the ideal place to have a selling gallery that sells out during a show. So we never had one-man shows. We decided to have our exhibits by categories: During the year, there’s Wall Art, Toys for Adults and Children, functional art for the home that we call Crafts for your Castle. We can stretch these categories – any thing that functions at all, we can call Crafts for your Castle. FR: When you had your exhibit of crafts, “Art in Crafts,” at the Museum of Art, Carnegie Institute, in Pittsburgh, was the exhibit made up of crafts that you were selling at The Store? BR: Yes, and that was an especially clever idea of mine, I must say. If we could sell good crafts in Verona, PA I felt other towns that size would also have people interested in good crafts. It was to be a show that traveled around to small towns. We would find a whole new audience. We showed all around Pennsylvania. FR: But the exhibit was very beautiful and you have rave reviews everywhere, even in Pittsburgh where the exhibit was held at Carnegie Museum. BR: That’s true, but showing at the museum here was disillusioning to me. I had assumed that if you showed at the museum they would help to publicize it. I found, however, to my amazement, that if we wanted an opening reception, we had to put it on ourselves. And we did. The museum didn’t do any publicizing except mentioning it in their magazine the month before. The show was successful. The show left the museum and traveled around to some small towns. Franklin, PA, Coudersport, which no one ever heard of, and Lycoming – places like that. It was such a big undertaking; we should have hired someone to arrange all the publicity. FR: I’m surprised that you didn’t get some help from the museum. Who was the director then? BR: It was Leon Arkus. Leon doesn’t like crafts and he just sort of tolerated the whole thing. But later he said that it was a fine exhibit and we found out it had the second highest attendance of any exhibit in the whole history of the museum. FR: Who designed all that? BR: Cathy (Betty’s middle daughter, a jewelry designer) and I did. They were very simple cases, which converted into crates. And the whole thing was designed so it could be picked up at one spot in an extra-sized van and taken to the next spot. I remember the first group that arrived here from Franklin to pick up everything came in a little pick-up truck that couldn’t possibly hold everything. So the only thing to do was to have them wait here at my house while I went and rented a couple of proper sized trucks and we drove them up to Franklin. When we went to Loretto – the museum there had much too large a room. It was a former gymnasium, three floors high, and we had to dismantle the whole thing and put it all together again. We went to eleven different places altogether. FR: Well, it was a marvelous exhibit for people who would never see such things. BR: Yes, that’s the reward – and educational service. They only see what’s at their local street fairs. As far as I know, there had never been a traveling show of crafts in the country – good crafts – since Objects USA, which was far earlier and more exotic. It was the work of very well known craftsmen, whose work was very expensive. That was back in the ‘60’s. It was a wonderful show but when you look at the catalogue now, it looks kind of quaint. I think in those early days the best craftsmen were doing very elaborate things. Crafts have changed since then. FR: Betty, why did you decide to open the New York Showroom? BR: Obviously, people who produce very little – a small quantity – can’t satisfy a commercial market. It seemed to me that if there were some central place where they could show their things – where stores could order small amounts from a number of artists thus getting the large quantity they want, that it would work. We were not going to charge any commission. It was to be a non-profit organization but the craftspeople would have to pay to be in it – $250 for a year – to cover the costs of operating the showroom. But we were going to subsidize the whole thing for the first three years. FR: How many artists did you start with? BR: We had estimated having about 400 applicants with about 200 accepted. Even though we tried to publicize it, many people didn’t know who we were or anything about us, or whether it would last. FR: Then they sent in samples that were kept in the showroom from which orders would be taken. How did it work? BR:There were no limits to the number of samples they could send but we did let them know we had limited space. We offered to pay all the shipping charges and we had a terrible mess when everything started to come in. Everything was to be in by the 1st of September (1983), but everything was late. We were so worried about having enough stuff to fill the 10,000 square feet of the showroom. FR: You may have known that but no one else did. The showroom was spectacular for the opening. Was it Irene Pasinski who designed the showroom? BR: Yes, and it was designed so we could move things around when we had to. 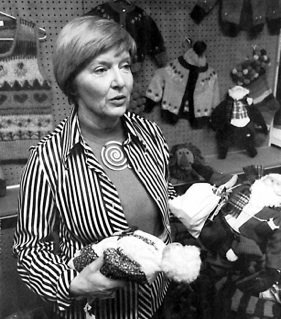 FR: Betty, you were breaking new ground – selling crafts wholesale in New York where buyers are from department and other commercial stores, used to buying manufactured goods that are standardized and can be bought in large numbers. BR: It led to a lot of confusion. Buyers would come in and want to order a gross of this or of that. It was hard to get them to accept the idea of buying one of a kind, to understand that everything was made individually and would not all be alike, or that colors might vary, and that they might not be able to reorder. Yet with all that, we did over $700,000 worth of business our first year. Now frankly, I was disappointed with that figure. I expected we’d do more than that. Stores from all over the country are buying from us. FR: When you think that this is such a new concept – hand made crafts and art objects have never been sold in this way before – and that it was done with very little publicity and almost no promoting at all, when you compare it with how commercial things are promoted, it really was done mainly through word of mouth. FR: When did you first get the idea for the showroom? BR:I think almost from the time that The Store opened and we started the Sociable Workshop. In the first place, I realized that when stores show crafts, they show only a few and with not much choice for a customer. I thought artists would be very interested – that it was a great opportunity for them. FR: You had a board of people connected with crafts from all over the country. Is the board active? BR:They’re from all over – California, Louisiana, Texas, New England. They’ve been very helpful – we talk together on conference calls, and they are in touch with crafts people in their part of the country and help in choosing whom we’ll show. FR: What was your original plan for the showroom? BR: I planned for it to become self-supporting in three years. No I think it may take five years. But that will be great. And if a store orders a number of crafts, we ask them if they would like some help in merchandising them. It’s been a good first year.